Nokia’s Chief Development Officer Kai Oistämö shared the atmosphere of a phone conversation he had with Elop shortly after realizing efforts on the MeeGo front were lagging: "It was truly an oh-s--t moment-and really, really painful to realize where we were," says Oistämö. Months later, Oistämö still struggles to hold back tears. "MeeGo had been the collective hope of the company," he says, "and we'd come to the conclusion that the emperor had no clothes. It's not a nice thing." “Elop stated the case simply: Nokia would either decide to stay with its own software or partner with Android or Microsoft, but it wouldn't delay. "I'm going to announce the decision at the analyst meeting in early February," he said. Sticking with MeeGo would avoid the need for a massive strategic and cultural shock, but going with the best offer could help Nokia's bottom line and gain it a fresh start in smartphones. "It was classic Stephen," says Myerson, who worked for Elop at Microsoft. "His superpower isn't his great intuitive judgment. It's his amazing ability to create a transparent, fast process that reasonable people can feel good about." 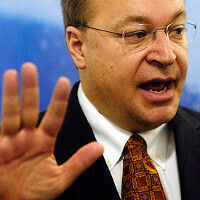 So while this doesn’t give an answer to the growing number of conspiracy theories about Elop purposefully pulling Nokia down, it does shed some new light on how the radical decision to write off Symbian and announce a new path for the company a year before Espoo was ready to step on that path was taken. I was really hoping Nokia had pushed for Android more than WP7. The potential is just overwhelming. Nokia HW + Android inside = WIN But then again, the conspiracy might just turn out true. Yes, the combination would've been LETHAL. Re: Cyborg Reading the whole thing, Nokia wanted to contribute to whichever platform and to be more than just another OEM if it went away from an in-house solution. Google's offer was identical to any other OEM and they wouldn't budge from that. With MS, Nokia got the deal that it wanted (Apparently Ms wanted nokia to do windows mobile before and Nokia wanted MS to use Ovi maps and give them revenue from it in return, as well as MS office on symbian). It also basically gave Nokia freedom to add whatever innovations they wanted to to the Windows Phone platform, and customize the heck out of it (at least relative to anyone else), plus a big load of cash. If you were given the choice based on these details, would you have seriously chosen Androind? In the long run, it may be the right decision. Windows has a ton of upside. But it is going to be a hard road to convert all of Nokia's current fans in all the different markets that these devices are worth a look. nokia should adopt a better product faster for MeeGo, symbian or windows. See how the Samsung and other competitors so aggressive with android or huawei which will also release wp7. if huawei more faster with their window device so that once again nokia is really lagging. kesuen jerene wong jawa..